I've had this idea for a while now but when I saw the Beach Bum set I knew it was the set to use. 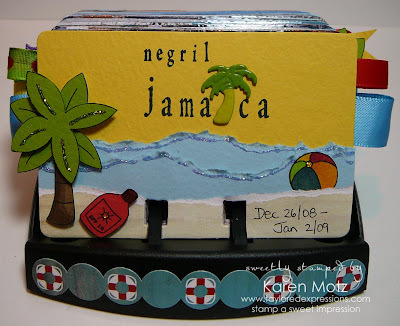 You see, I started paper crafting as a scrapbooker (way back many years ago) but I haven't really scrapbooked much since I discovered rubber stamping and cardmaking 6 years ago. The only problem...I never stopped taking pictures. 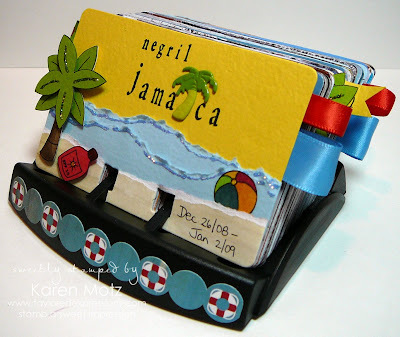 So I was looking for a quick and easy way to get my vacation photos into a "scrapbook" when I came up with the Rolodex Book. 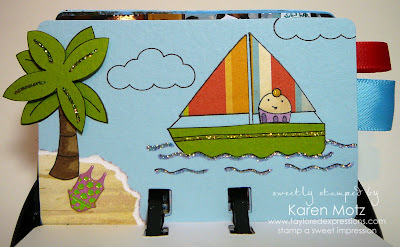 I'm calling it an "unscrapbooked" project for the non-scrapbooker! LOL! Because really, it's just like stamping little cards. 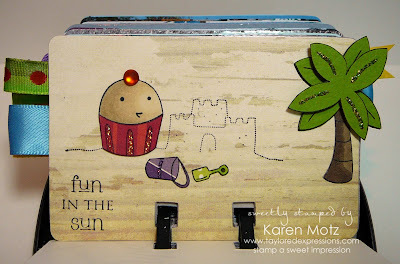 I started with a plain Rolodex that I picked up an office supply store and I used the rolodex Sizzix die cut from Stampin' Up for the pages. 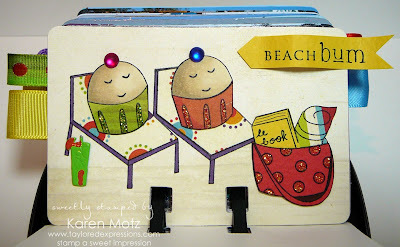 I used the Beach Bum stamp set and the Beach Bum Key Ingredients, along with plenty of Stickles and a fun assortment of summer shaped brads. On the cover I used my JustRite lower case Times New Roman font and the rectangle stamper for the title. I created a little beach scene then penned in the dates of our vacation in the lower right corner. I added ribbon tabs to each of my divider pages so whomever is looking at it can easily flip to a different section. Who goes to the beach and doesn't play in the sand? There are plenty of pictures of my niece and nephews in this section. The images on the divider pages are done with a combination of paper piecing and copic markers. The beach bum section is home to photos of mostly the adults...LOL! And of course, a little swimming in the ocean and the pools was in order. We weren't swimming with sharks though (that I know if anyway) so I only inked up the little swimming Cuppie and stamped him three times so he'd be with his friends. We also had lots of fun using the resort sailboats and taking a boating excursion to Rick's Cafe, so this section holds all those photos. The cloud stamp is from the Branching Out Coordinates. In just a few hours I was able to "unscrapbook" our Jamaica vacation and I have 107 photos to proudly display. It would also be super easy to go back and add journalling cards to each section too (yeah right...LOL!). Wouldn't this be a great gift idea? Hmm...my family's coming to visit in September, do I have enough time? Don't forget to sign up for the TE Newsletter...the link is in the sidebar. It's full of fabulous information on products, sales and creative ideas. Also, just a reminder that Taylor is smack dab in the middle of her big move from California to Iowa so the TE Store will not be shipping any orders until July 13th. The Store is open and taking orders though. WOW!!!! That is adorable. So creative, so unique, such a great idea! I'm off to the office supply store. Looks like I have a new project to start today! HA! 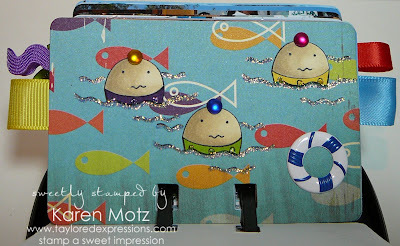 what a super duper cute project, only problem is - I'd love to see your pics from vacation! I absolutely love this. I'm going to keep it in mind for my vacation photos. tooo cute . . . but i wanna see some of the picture "pages". curious as to how you "scrapped" those! awesome idea!!! OMG!!!!! this ROCKS!!! what a cool idea!!!! Karen, this is so stinkin' ADORABLE! So very clever! Love it! NO WAY! This, my dear friend, ROCKS!!! What an AWESOME idea and stunning execution! You are one smart and saucy chick!! What a fun way to display photos Karen! great job on this!